On 21st June 2019 we Welcome The UK’s finest Black Sabbath tribute! Sabbra Cadabra is the closest thing you can get to an early 1970s Black Sabbath show without using a time travel device! The group features Neil Priddey on lead guitar as ‘Tony’, Tim Campling on bass as ‘Geezer’, Stuart Mills on drums as ‘Bill’ and of course, starring as ‘Ozzy’, is vocalist Kevin McGillian. The Sabbra Cadabra show is a very faithful reproduction of early Sabbath material, featuring absolute classics from the first 8 albums with the original line-up between 1970 and 1978. The attention to detail with performing and attempting to look like the Godfathers of Heavy Metal is simply superb. After all, you don’t want to watch just a bunch of guys in jeans and t-shirts do you?! Sabbra Cadabra get as close as you can get to being authentic to the legend that is Black Sabbath, so they don’t play any Ozzy solo material, they don’t play anything from after 1978 and they don’t play the songs like a covers band would! 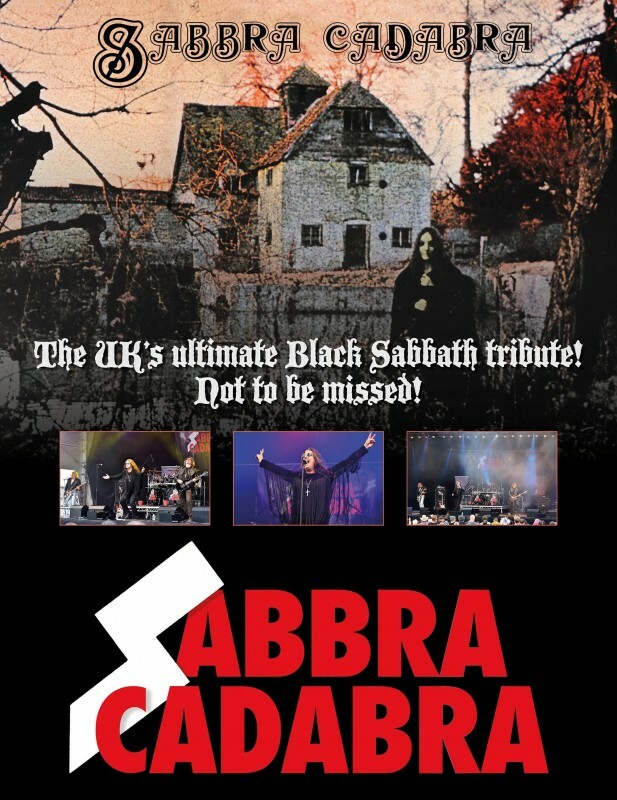 For a totally absorbing and realistic Black Sabbath material (and many have said better-sounding than the last couple of Sabbath concerts...) then you simply cannot miss seeing Sabbra Cadabra for the best Sabbath experience you’re likely to see! Don’t miss it! Sabbra Cadabra play 2 hours of non-stop classic Sabbath...no Ozzy solo songs...no Randy Rhoads or Zakk Wylde 'interpretations' of Sabbath...no dodgy wigs...no 'pub band cover versions'...no changing the keys from the originals...THE ULTIMATE TRIBUTE TO SABBATH, PLAYED LIKE SABBATH, SOUNDS LIKE SABBATH! Once the guys have finished their fantastic set a 'Rock' DJ Will Play on until late.